The petrochemical industry is devastating the state, but no candidates dare take it on. The Louisiana shrimp processor sat looking over the marina at Grand Isle, a ramshackle resort destination south of New Orleans on the Gulf of Mexico. Blanchard’s business was hit hard by the BP oil spill in 2010 and is still struggling. BP, he noted, is doing fine. Just two years after the spill, the company announced a record profit. The BP spill may be the most obvious destruction that the oil and gas industry has inflicted on Louisiana, but a slower devastation is happening all along the coast: the equivalent of a football field an hour disappears as the land sinks and the ocean rises. Blanchard’s dilemma is far from unique. Landrieu exemplifies the subservience to energy interests that has defined Louisiana politics for decades. But like so many contests before it, the Senate race offers voters no referendum whatsoever on how much power the energy tycoons should have in the state. Moreover, given that the energy sector employs about 287,000 workers there, many people are forced into a Faustian bargain with an industry that is simultaneously employing them and wrecking their land. The question is whether this situation is permanent. The BP disaster exposed an already fraught relationship between the oil and gas industry and the residents of Louisiana. Deepwater Horizon was simply the most dramatic of a thousand petrochemical disasters whose collective toll includes not only the vanishing coastline, but also cancer clusters around the refineries and chemical plants. Some real pushback can finally be seen, from citizen-organizing campaigns to lawsuits with the ability to make the industry truly pay for its transgressions. This year’s Senate campaign isn’t the first to offer no real choice to citizens sick of the industry’s grip on the state. But might it be the last? One major watershed came last year, when a state levee board created after Hurricane Katrina sued ninety-seven oil and gas companies for “a mercilessly efficient, continuously expanding system of ecological destruction.” The energy industry blames the levee system and ocean erosion for the massive coastal land loss. But the US Geological Survey estimates that oil and gas activity accounts for at least a third of the damage. The industry’s allies in the Legislature responded swiftly with seventeen bills designed to stop the legal process from playing out. Only one of them passed; it was so broad that the state attorney general recommended a veto by Governor Bobby Jindal, out of concern that the bill would undercut pending and future suits over industry malfeasance. Jindal signed it anyway. Most people outside Louisiana haven’t heard of the suit, but it rocked the state. One veteran activist described it as the most significant political event in Louisiana in a decade. It was the first large-scale challenge to petrochemical interests with broad popular support, and many saw it as a test of how far lawmakers would go to protect their patrons over their constituents. It remains an open question whether the coasts can be saved. Grand Isle is being swallowed by the ocean faster than any other place in the United States. Coastal Louisiana is now 25 percent smaller than it was during the Great Depression. The National Oceanic and Atmospheric Administration has erased dozens of bayous and other landmarks from its charts. The only road to Port Fourchon, which serves 90 percent of the country’s offshore oil production and 18 percent of all crude produced in the United States, is sinking. Things are likely to get worse, not better. As the National Climate Assessment released by the White House in May pointed out, pre-existing land loss makes Louisiana exceptionally vulnerable to storm surges and other anticipated effects of climate change. It’s not a lost cause—radical steps to reverse global warming could at least slow the ocean’s takeover. But Landrieu isn’t likely to be a part of that solution. Landrieu has been aggressive in seeking funds for coastal restoration. But her main proposal—giving coastal states a greater share of royalties collected from offshore drillers—accepts continued high carbon output as a given, and locks in the state’s dependence on the oil industry. As a 2013 report by the Center for American Progress noted, relying on revenue sharing to fix historical damage fails “to account and compensate for the full environmental costs of ongoing and future development activities” in the Gulf. Landrieu’s record presents a tricky situation for activists trying to move the ball forward on climate change. Cassidy, her opponent, is an outright global-warming skeptic who once wondered if rapid temperature changes “could be just a shift on the axis” of the planet. But for many green groups, being the least-bad candidate isn’t enough to earn their endorsement or cash. The League of Conservation Voters, for example, plans to spend five times more this cycle than it did in the 2010 midterms, mostly on Senate races. None of it is slated for Louisiana. Landrieu, of course, has done just about everything in her power to support the industry that employs them. She has lobbied successfully for expansions of offshore drilling, voted to block the Environmental Protection Agency from regulating greenhouse gases, and is a vocal advocate for the Keystone XL pipeline. Shortly after the BP spill, she held up the nomination of Jack Lew as Office of Management and Budget director to protest the moratorium on deep-water drilling in the Gulf. But to the offshore workers on Grand Isle, it didn’t matter. “I’m gonna vote for whoever’s running against Landrieu, as long as they support what we do,” said one of the men, who didn’t yet know the names of Landrieu’s opponents. 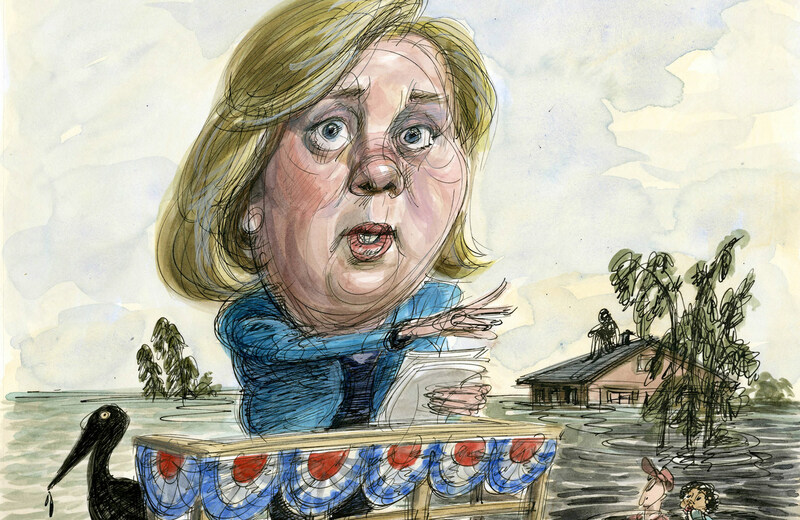 Landrieu may have triangulated herself onto a lonely island—one that, like many on the coast, is in danger of being swallowed up. Meanwhile, many people in Louisiana are taking matters into their own hands. Mike Schaff is a resident of Bayou Corne, a community in the southern part of the state where, two years ago, one of the massive salt caverns hollowed out by petrochemical corporations collapsed. The sinkhole is still expanding, and only a handful of the bayou’s 350 residents remain. Schaff describes himself as a Tea Party Republican, and he’s hesitant to call himself an environmentalist. But his critique of the oil and gas industry is far harsher than that of anyone running for the Senate. What happened in Bayou Corne was one of many events that led to the formation of the Green Army, an unprecedented coalition of green and religious groups working to upend the political dominance of the petrochemical interests. The Green Army is led by Russel Honoré, a charismatic, brusque retired Army general who earned celebrity status for taking charge of the disastrous federal response after Hurricane Katrina. One of the campaigns undertaken by the Green Army is an anti-fracking movement in St. Tammany Parish, a wealthy, conservative district on the north side of Lake Pontchartrain. Helis Energy plans to drill at least one fracking well there soon, and it obtained the rights to lease some 60,000 acres in the parish. Concerned citizens swarmed parish-council meetings, and the parish government is now suing to prevent the state Department of Natural Resources—widely criticized for acting as a subsidiary of oil and gas interests—from approving the project. Some of the opposition is based on the preservation of personal property, not outright environmentalism, but it’s still notable in a state where oil and gas companies are used to getting everything they ask for. Landrieu and Cassidy have offered bland statements on the controversy, with both expressing respect for community-level decision-making and support for the fracking industry overall. “The corporate mentality in Louisiana is that we have to do this to maintain a good economy,” said Honoré when we spoke over the phone in September. “We’re the second-poorest state in the nation, and we got all this oil and gas. So what’s happening to that money? It’s going to a select political class. The oil and gas companies have hijacked democracy.” Indeed, Louisiana has the highest rate of public-corruption convictions in the nation. Between Baton Rouge and New Orleans, the Mississippi River snakes between petrochemical plants and the remains of sugar plantations. Some of the grand antebellum mansions have been preserved, thanks to oil money. The relationship strikes Rolfes as more than incidental.